Do it in style. Who said that you can’t look stylish in the kitchen? Kristen from The Dating Divas made one very stylish and flirty apron. Love it! It’s time to get practical. Want to make your cleaning chores easier? Heather from The Creative Homemaker has a solution for you. Cleaning apron with pockets for all your cleaning “accessorises”. So check out the tutorial at her blog. If you have a garden then you need a gardening apron. 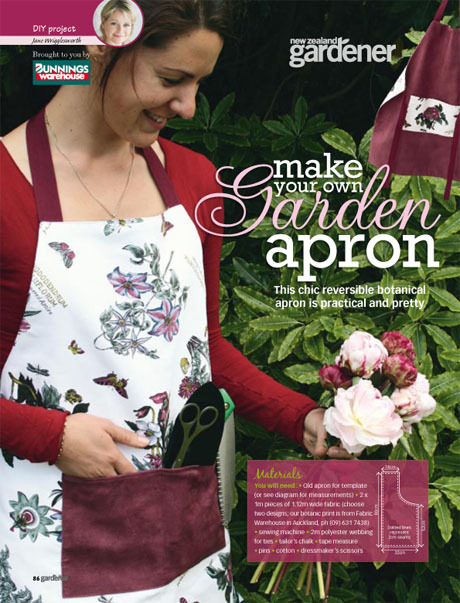 Jane, from Flaming Petal, made very pretty reversible garden apron. Visit her blog to download the PDF instruction. Now I have an apron for doing the dishes, an apron for cleaning, and one for gardening. Is something missing? Yep! I most definitely need an apron for crafting. Found one! You can see it too on cuteable. You have a pair of old jeans that you’ll never wear again but you love them too much to throw them away. Guess what you can make out of them? 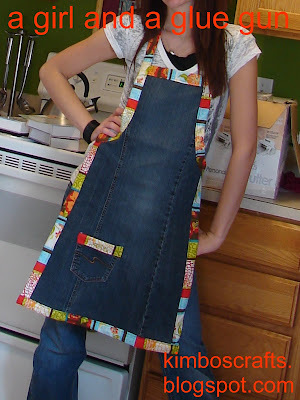 Yeah, you’ve guessed it, you can make an apron! Kim, from A girl and a glue gun will show you how it can be done. So, put your cute apron on and let the work begin.